As a preteen, I loved Bertrand R Brinley’s The Mad Scientists’ Club. As an adult, I read these pre-MacGyver, Do-It-Yourself stories to my daughter, and still loved them. In these stories, a group of boys, including one wild dreamer, concoct and carry out stunts like building a sea monster, haunting a house, winning a hot-air balloon race, and making a man fly. The stories are fiction, but they aren’t science fiction; these kids were handling real engineering problems. The technology, ranging from ham radios to ultraviolet lamps to army surplus balloons, was readily available when they were written in the 1960s, and Brinley, with a background in science and technology, knew what he was writing about. When the kids created their remote-controlled sea monster, my fingers itched to join in, and I believed that, with a little effort, I could build one of my own. By today’s standards, the technology is outdated low-tech, but I’d like to hope the Can-Do attitude never goes out of date. Do these stories still appeal to today’s young readers? Hard to know, based on my limited sample, but the fact that they’ve been reprinted multiple times and are still available new says someone besides me likes them. I should point out that they are slightly subversive; they are not about following the rules. They are about imagination, initiative, and teamwork, but these kids were running around unsupervised (small chance of that, these days), sneaking out of the house at all hours of the night, and in a few cases, causing non-trivial trouble for their elders. But I can’t get too excited over the cost of their antics. For the most part, this was good, clean fun, as well as laugh out loud funny. There are no girls in this club—unfortunate, but that’s the way it was. That may be a stumbling block for some girls, but some, like me, will love them. There’s very little in them that’s gender-specific, and I identified with these kids as kids. Twelve of these stories were short stories originally published in Boys’ Life magazine and then collected in two volumes, the original The Mad Scientists’ Club and The New Adventures of the Mad Scientists’ Club. The other two were separate book-length stories, The Big Chunk of Ice and The Big Kerplop! They are available in those four separate books, or in one omnibus collection. 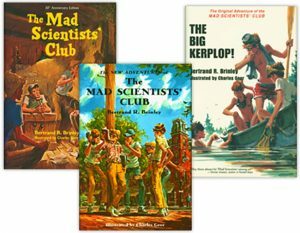 I read all but The Big Chunk of Ice to my daughter, but the ones I remember from my childhood, and that still seem the best, were the ones in the original The Mad Scientists’ Club volume. Audience: boys and girls of all ages.